The Sustainability in Schools Game is a fun way to expose teachers and administrators to Education for Sustainability, the process of integrating sustainability into schools and uncover opportunities for the school to be more sustainable and perhaps to save money. 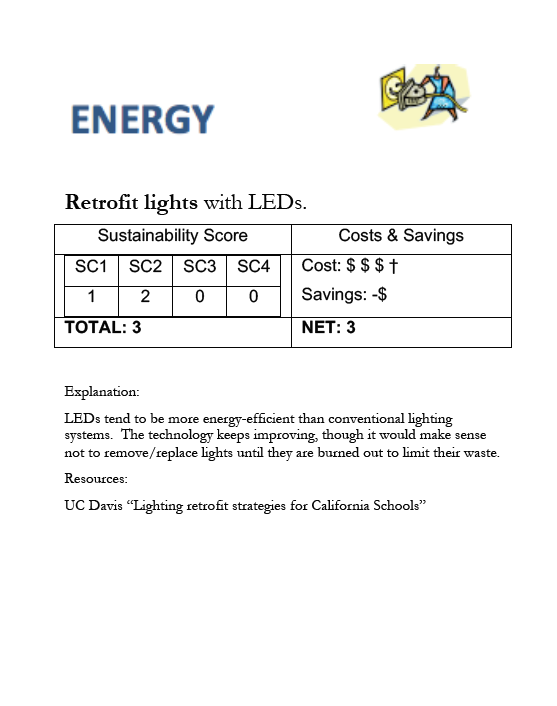 It helps schools identify sustainability-related practices (e.g., that save energy and water, reduce waste, or improve student health) that have the best return on investment, the biggest bang-for-the-buck or time invested. Educators are dealt a set of cards from a deck of 45 Sustainability Project Cards (covering waste, water, energy, purchasing and food). They identify the practices or projects that make the most sense for their school and organize them into a two-year plan. The game can be used as a teaching tool —to expose educators to the concepts and practices—but can also be used in a particular school as a planning and consensus tool—to develop a 2-year sustainability implementation plan. This game focuses on operations because implementing sustainability can, if wisely done, save the school money and engage the community. However, players also explore how these sustainable practices can be woven into classroom instruction. 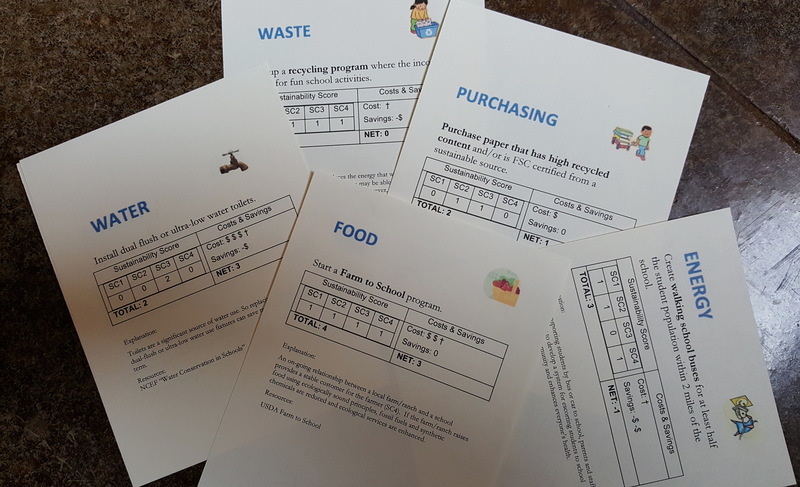 Participants are broken into teams and given a stack of cards which have sustainability-related school projects with associated sustainability benefits and costs (time and money, along with projected cost savings). The cards are dealt out and each participant puts down a card they think would be good to do. As a team the group reviews the cards and swaps out projects. Participants have a budget (cost and time) and must choose amongst the project options to build a two-year Sustainability Project Plan. (In game mode, teams can be scored on the Cost-Benefit of their plans.) Participants also examine ways to use their projects as learning opportunities, identifying where they can be inserted into the curriculum. The game can be played at several levels of challenge, including creating a 5-year plan for a fully-sustainable, net-zero-everything school. integrate them into lesson plans. Players learn what can be done in schools to improve their sustainability. Players discover which projects have a good return on investment. Players understand how to sequence projects for maximum benefit. Players learn how to build a 2-year sustainability plan (first generation). Players learn how to integrate projects into classroom instruction. This game is built on The Natural Step principles for a sustainable society. To run/play this game download it from the game’s website.